Russ here. Today is Stretch Tuesday, and our topic for today is Fenton’s Stippled Ray Compotes in Stretch Glass. 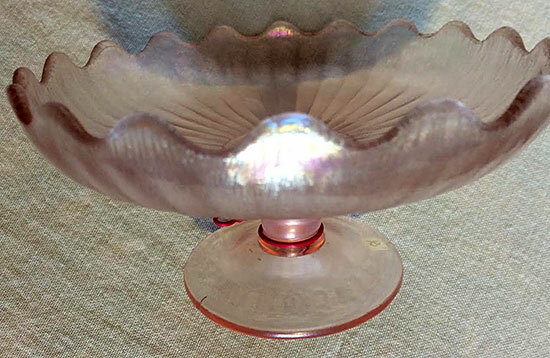 Fenton’s Stippled Ray pattern is quite easy to find in carnival glass without the stretch finish). 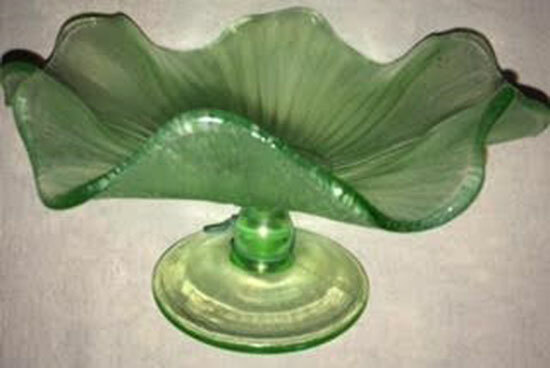 Which simply means that when a piece of carnival glass is made; after the iridescence is sprayed on the surface of the glass you put the hot piece of glass into the lehr oven (a special oven to very slowly bring the temperature of glass to room temperature so that the glass hopefully won’t have any stresses or inclusions which might make the glass break when the temperature rises or falls), you will have made a piece of carnival glass. But before the piece is put into the lehr, if the piece is reheated the iridescence [made of metallic salts] separate to make a stretch (onion skin like) finish. Then the glass would be put into the lehr to slowly cool. 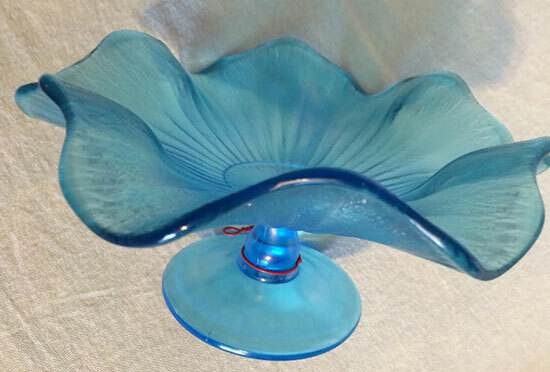 The extra reheating makes the difference between carnival glass and stretch glass. 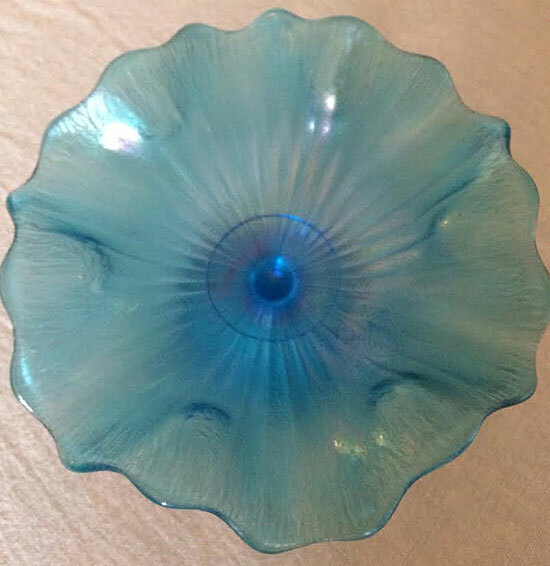 Many of the carnival glass pieces that have a “stretch type of finish” around the edge have been put into lehrs that were too hot. Unfortunately or fortunately for collectors, quality controls were close to nonexistent in the 1910 era. Many of today’s whimsies and one of a kind pieces were due to poor quality control. Also many of the glass houses encouraged workers to play around with the glass (usually on their own time) for new ideas on glass lines. So many of the glassworkers took the glass that they made on their lunch hour home for gifts to their families. Back to the Stippled Ray’s pattern. It is simply rays of plain glass and then a ray of stippled glass all around the piece. The rays of stippled glass reflect the light more intensely because of the larger surface of glass in the many little bumps on the stippling than on the plain rays which gives a pleasing effect to the Stippled Ray’ pattern. 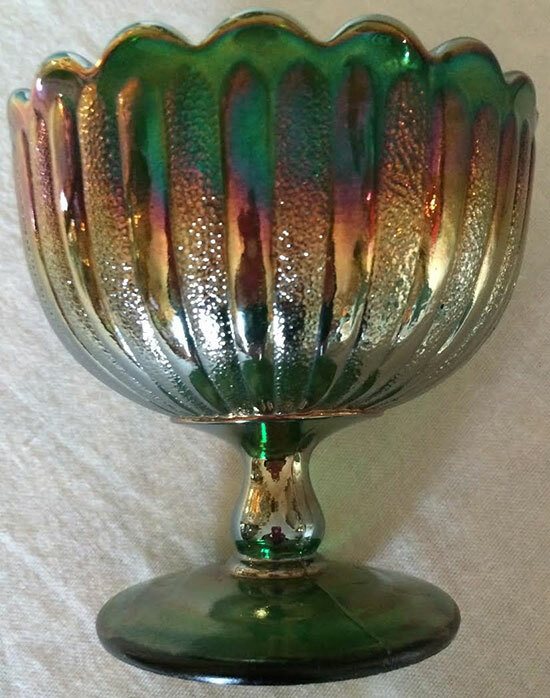 The Fenton Glass Company is known to have mainly a very consistent quality of iridescence. 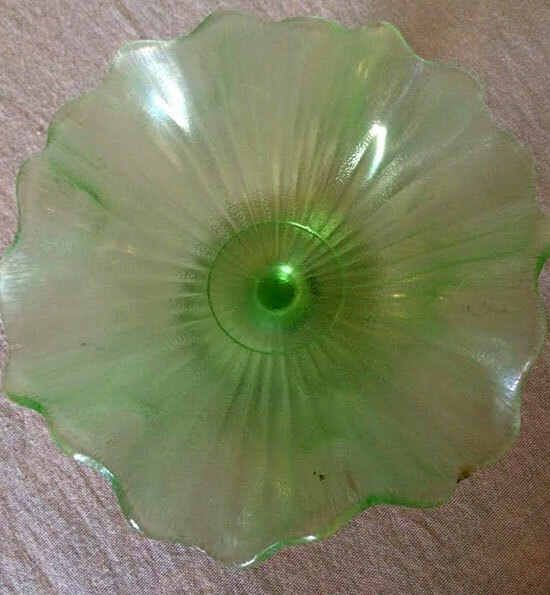 The Imperial and Dugan/Diamond had some glass workers that really applied a heavy “dope” (chemicals that make the iridescence spray -not illegal drugs!!!) 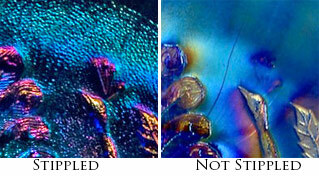 of iridescence which make for the brilliant iridescent color that we collectors enjoy. 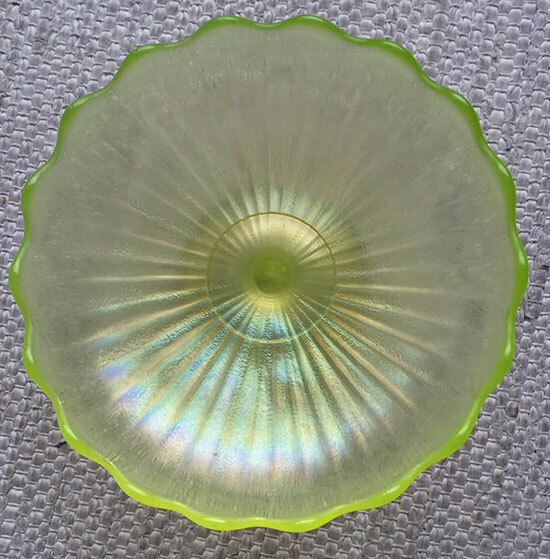 But not all of the carnival glass produced at these same glass companies, has the high iridescence but many pieces barely have any iridescence at all! 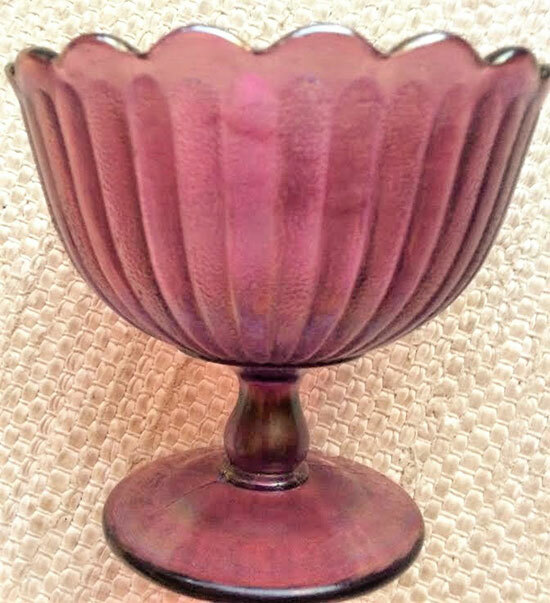 The old saying about Imperial Glass is that a piece is either fantastic or terrible and not many pieces in between! 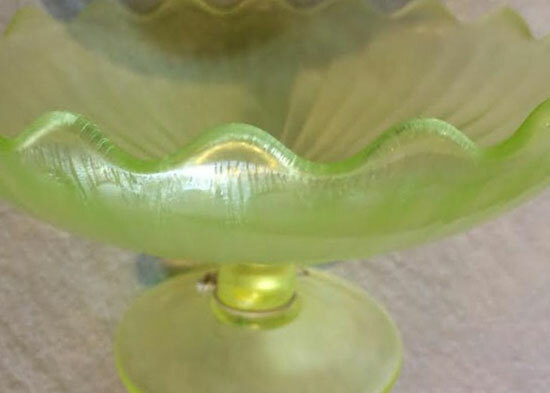 The Fenton Stretch Glass Stippled Ray pieces were made around 1925 according to William Heacock in his book Fenton the Second Twenty Five Years. Some of the compotes have a round bowl, ruffled bowl, and a cupped bowl. Colors are Topaz, Florentine Green, Velva Rose, Celeste Blue and Wisteria. The celeste blue pieces bring the most money. But the wisteria is the rarer color. Rarity and desirability are two very different factors in the pricing of all collectables. 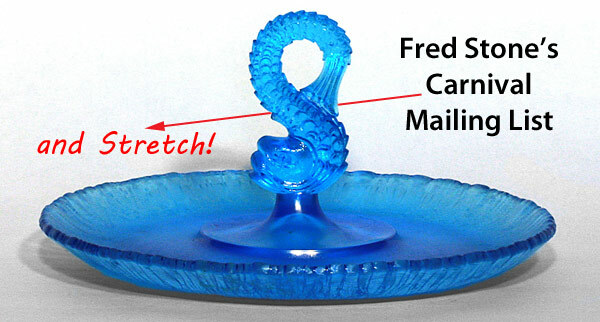 Has anyone seen any other colors or shapes in the Fenton Stretch Glass Stippled Ray pieces?